With the rise of mobile gaming, one of the genres that have slowly become more relevant is text-based games. These kind of games are ideal for being consumed in small bursts, are not battery-hungry, and often have interesting stories to tell, making them ideal for consumption on phones. They are also more interactive than reading a book, making them a good balance between gaming and reading. 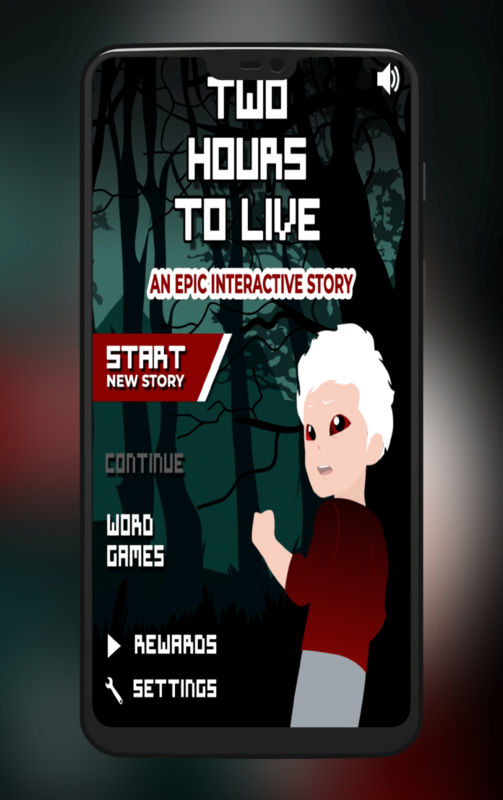 Two Hours To Live takes this concept even further, giving you limited time to complete a story, and making you a part of it. Two Hours To Live is a text-based game in which the choices you make decide the outcome of the story. After having a virus injected by an unknown scientists, the main character is given a two-hour limit to pay money to be saved, or die if he refuses to cooperate. Every now and then, you are asked how do you think the story will unfold. 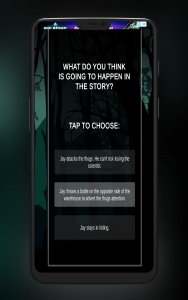 Your answers are the difference between saving Jay or dying before the story is completed. There is a timer reminding you at all times how much time Jay has left. In case you answer something and the story doesn’t go in that direction, you lose time, which means you won’t get until the end of the story. 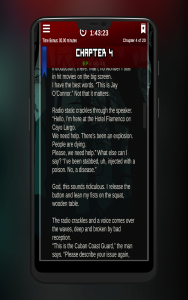 Unlike other text-based games I have played (like Lifeline), this one consists of a long scroll view with the text written on it. It doesn’t scroll by itself or presents the text in some kind of dialog interface or something similar. The whole game, which is divided in chapters, is a big block of text that you have to read through. In order to avoid cheating (that is, going through the whole block of text quickly to reach the end with lots of time), the game lowers the timer automatically in certain sections. This means you will always have the urge of finishing quickly, even in subsequent playthroughs. When you reach the end of certain chapters, the game asks you what do you think is going to happen next, and gives you three different options for you to predict. If you get the right one, you will see a positive message and letters at the top of the screen (that spell EPILOGUE) will turn green. I suppose that, by filling all of the letters, you will reach the end of the game. Unfortunately, my decision making wasn’t good enough to reach this, and I frequently got negative messages by Jay, and reductions in my available time as a consequence. Getting all of the prompts correctly means that you either have to be good at guessing, or you need to do several runs in order to remember where the story goes. Sadly, I have already described all interactions the user makes in Two Hours To Live. You scroll through text and occasionally get asked questions that may or may not lower your available time. There’s also several transitions between chapters in which you are presented with full-screen ads, which, as you know, are the worst offenders in terms of obtrusiveness. They even created some folders on my device with some kind of cache. There’s a bookmark feature that replaces the save button, making it more appropriate for a text-based game. However, I found the hard way that this is the only way of saving. There’s no such thing as auto-save. This means that if you don’t bookmark your current position, and then exit the game, your progress will be lost. It’s very uncommon to see games that ask you to save by yourself (Pokémon games spring to my mind), but it’s not a dealbreaker. I just had to re-do four chapters. With so little interactive elements, then the story needs to be good to keep the game afloat and interesting. Fortunately, the story meets expectations, with interesting and intriguing elements that keep you on the edge. There are some elements I consider annoying, like the constant babbling of Jay’s wife, which add very little to the overall story. Also, there are some very minor grammatical mistakes on the text. The biggest problem that I had with it is the name “Escorpiones Negras.” This is some kind of drug dealing group that is central to the story. With such a prominent role in it, the developer could have at least researched a little bit about Spanish language. The correct expression would be “Escorpiones Negros” because “escorpiones,” Spanish word for scorpions, is a male noun. Having to read through such a big mistake so many times throughout the story made me enjoy it less, since it just cuts out the immersion. I don’t know where to start here. The graphics are appalling, there’s no way around it. The interface is horrible, the use of colors is horrible, and the style is horrible. There’s at least four different fonts used throughout the game, if not more. The font for the title of the game is different from the “New Story” label in the Start New Story button, which is already different from the “An Epic Interactive Story” subtitle. Sometimes the text has glow, sometimes it has shadow. Sometimes the shadow is black, sometimes yellow. The Start New Story button looks different than the continue button at the bottom of each chapter, which also looks different to the buttons used for the outcome prediction. Everything is all over the place. Worst of all, the game hasn’t been optimized for the long screens we have now. I thought at first that the game looked a bit stretched out but dismissed it. However, when I re-checked the screenshots in the Play Store, I now see that the interface I got is massively stretched, since the game apparently was done with a 4:3 screen in mind. The game changes its music depending on the situation. You start with a calm soundtrack, which then changes into a song that just screams “hurry up,” to almost silent surroundings when you are in the forest. Out of the audiovisual elements of this game, the music is the one that actually stands out for being acceptable rather than unpleasant. Two Hours To Live is a good idea on paper. A non-linear story that makes you choose the outcome of your character, while, quoting Linkin Park, “the clock ticks life away.” At least, the story part delivers on the excitement, with Jay unraveling the plot he has been dragged into in a satisfying way. However, the actual interactiveness of the game is not that big. While your decisions do affect the outcome, since a wrong choice means Jay is closer to his death, there aren’t that many prompts throughout the game to actually feel like you are making a difference. Coupled with terrible graphics and obtrusive ads, Two Hours To Live is sadly not as good as it could have been. Download and install Two Hours To Live from the Google Play Store.